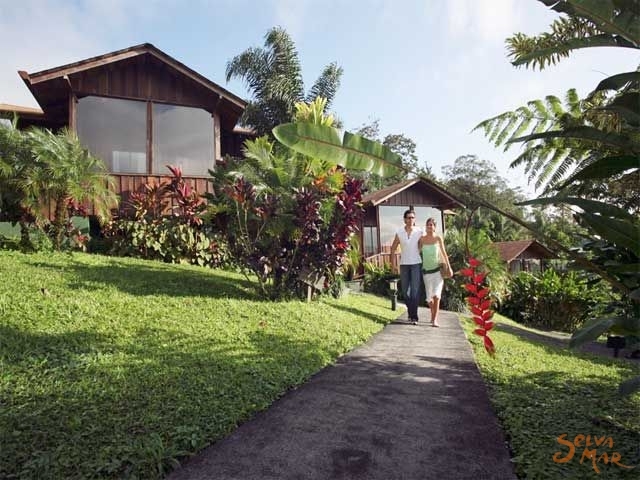 The Arenal Paraíso hotel is located just in front of the Arenal volcano only 2 hours and a half from San José. The scenic beauty of the area perfectly blends with our exuberant gardens and the singularity of our rooms. The hotel has a total of 124 rooms of which 74 are superior or suites. 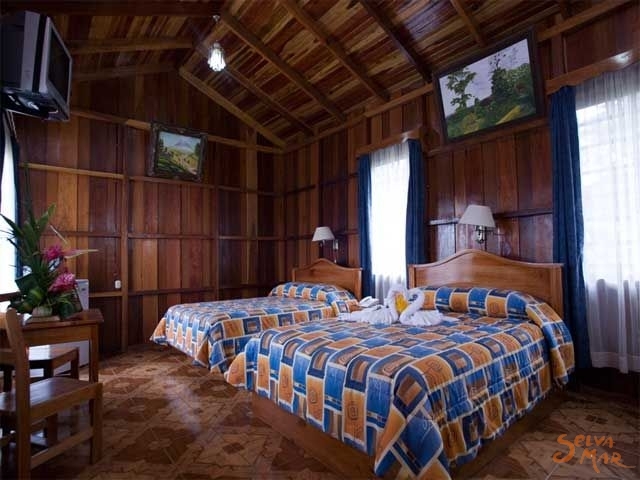 These rooms are built entirely in hard wood with all the modern amenities. They have 2 double beds, a comfortable bathroom with hot water, cable TV, telephone, a small fridge, air conditioning and also a balcony with rocking chairs to enjoy the view. The hotel also has 42 standard rooms built in concrete and very nicely finished. These rooms have one double bed and one single bed, cable TV and a mini fridge. The hotel has a fabulous Restaurant known as the Rancho Paraíso Steak House. It is modern and large and can comfortably seat over 200 people. It specializes in meat and international cuisine. We are particularly proud of our communal areas and our 3 pools. The main one is large and crossed by a nice bridge. The second is a hot spring mineral water pool with a wet bar, ideal to relax in, and children can have fun in the small hot spring mineral water pool. 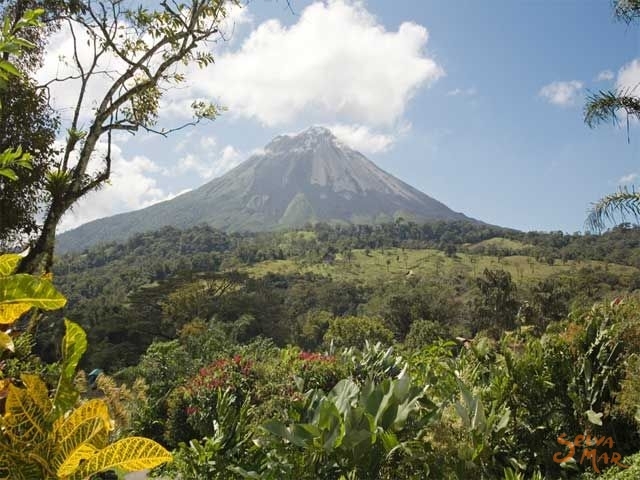 Our main attraction is the Arenal Volcano but the hotel also offers several other exciting activities such as a forest trail hike, which will give you the opportunity to admire the wildlife and beautiful waterfalls. 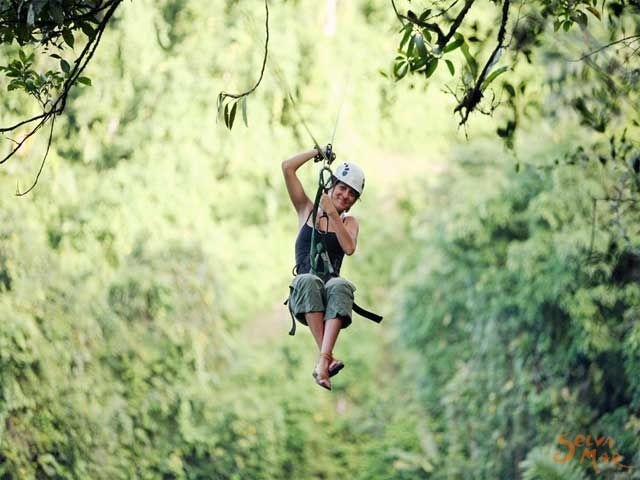 You may also try the canopy tour. Our tour desk can help you make your choice of activities in the area. You may also want to visit the souvenir shop offering a variety of Costa Rican handicrafts or treat yourself to a revitalizing experience at the very special Mayin Spa. 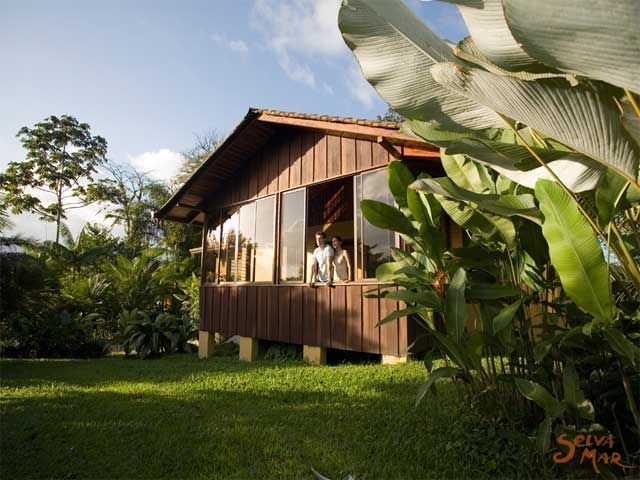 The Arenal Paraíso hotel is definitely the ideal choice for total relaxation in the midst of nature. The best place to enjoy peace and nature! These rooms have private bath, hot water, air conditioning, telephone, cable TV and a small fridge. The building is made of block and all have a balcony just in front of the majestic Arenal Volcano. Superior room includes the same services that the standard, however, these bungalows are bigger, the balcony is surrounded by glass, and the building is made of wood. In addition, these rooms offer air conditioning. These rooms have plenty of space with capacity for 8 persons; the rooms have 2 bedrooms, each bedroom with their own private bath with hot water. The main bedroom has a king size bed and a queen size bed. The second bedroom has two double beds. Our suites are fully equipment with: refrigerator, phone, air conditioned, cable TV, microwave, kitchen, living room and a balcony with a great view to the Arenal volcano. Driving from San José: Please take the Panamerican Highway North towards the the Juan Santamaría International Airport, when you get to that point keep driving to San Ramón, after approximately 74 Km you will find the San Ramón Village entrance. Drive through the town until the road ends, at that point turn to your left until you get to a traffic light, at the traffic light turn to the right. Keep following that road for approximately 2 hours passing the towns of Los Angeles, Balsa, Bajo de Los Rodríguez and Chachagua. After Chachagua you will get to a voluntary toll, turn to the left at the toll and keep driving until you reach La Fortuna and when you get to La Fortuna downtown turn to your left at the church and keep driving for approximately 10 minutes (7 kms). We are located at the right side of the road. High season prices apply from July 1st to August 312013***.